A quality little debut for Maxwell, offering decent performance incredibly efficiently, while also hinting at the future possibilities for the architecture. The GeForce GTX 750 Ti is an Nvidia first, in many ways. It's built around the new Maxwell GPU architecture, and I reckon it's also the first time Nvidia have released a new graphics design without launching a top-end iteration first. The GTX 750 Ti may still be rocking the same 700 series badge, but it's a new generation of graphics silicon. 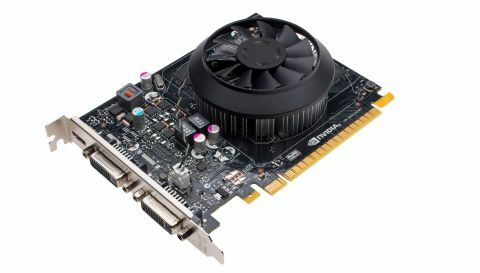 The GTX 750 Ti is a reasonably priced graphics card - at £115 / $150 it's designed to sit in the volume end of the market and offer an upgrade to as wide an audience as possible. Thanks to its new design it actually spreads the net far wider than previous cards at the same price. What's this Maxwell GPU business about then? It's the code-name for the next generation graphics silicon from Nvidia following on from the Kepler architecture behind the desirable GeForce GTX Titans, GTX 780 Tis and GTX 760s. It's not designed to deliver a generational leap in gaming performance. The new architecture is more about silicon efficiency. The GTX 750 Ti delivers similar performance to the now-retired previous incumbent of the £115-£120 price point: the GTX 650 Ti Boost - one of my favourite cards from the last generation. The GTX 750 Ti is able to perform at the same sort of levels in-game - sometimes a little quicker and sometimes a little slower, but only ever a little. Given the lack of a performance boost, you'd you'd be forgiven for assuming Nvidia had been following AMD's recent line of simply re-badging old silicon with new naming schemes. But a quick look at the power demands and temperature of this new card will tell you immediately that it's a different beast. Nvidia has streamlined its GPU internally. Where the Kepler's GPU are made up of Streaming Microprocessors (code-named SMX) with 192 CUDA cores in each with one set of control logic per SMX, the Maxwell chips separate each of its own Streaming Microprocessors (code-named SMM) into four separate processing clusters. Each of these clusters has 32 CUDA cores and their own control logic. That does mean each SMM only contains 128 CUDA cores as opposed to the 192 CUDA cores of the old SMX, but the increased control logic makes them far more efficient. Nvidia estimate each CUDA core is now some 35% quicker than with the Kepler architecture. So, while gaming performance hasn't moved on from similarly-priced Nvidia cards of the last generation, the power requirements and temperatures have dropped off considerably. It's the same story when you compare with a competing AMD card in the same area. The Radeon R7 260X is both hotter and more power hungry and performs similarly in-game. The GTX 650 Ti Boost peaks at around 72ºC and 225W in terms of total platform power and the R7 260X tops 83ºC and some 192W. The GTX 750 Ti beats both considerably, coming in at a maximum of 54ºC and 164W. That means GTX 750 Ti boards can be both tiny and relatively powerful and ideal for really small form factor, 1080p machines. You don't even need to have a separate PCIe power connector either as it can draw its 60W TDP from the 75W on offer from the PCIe slot on your motherboard. This in turn means the GTX 750 Ti is an upgrade that's more widely accessible than something like the GTX 650 Ti Boost, or competing AMD cards, can manage. With no need for external power anyone can drop this card into an old off-the-shelf machine from PC World - so long as it's got a spare x16 PCIe slot - and get an impressive performance boost. That means we should see the GTX 750 Ti coming in with very different designs. There will be half-height boards to fit ultra small form factor machines, single slot cards for that slimline look the 8800GT sported to such good effect, and overclocked versions with heftier coolers and external power connectors for extra oomph. As well as representing an excellent little upgrade card budget rigs the GTX 750 Ti also gives us a taste of what's to come with the higher-end, second generation Maxwell GPUs. The GTX 800 series cards are based on a smaller production process - 20nm versus the GTX 750 Ti's 28nm - and that should increase power efficiency even further. But right now this is a great option for anyone looking for a well-priced, low-power upgrade for their rig. And if you've been sitting on a lowly machine without the capacity for a decent graphics card before, now you can be gaming happily at 1080p without needing to upgrade your PSU and for only just over $150 / £100. While the actual gaming/graphical performance isn't really offering much in the way of improvements at this mainstream price point just take a look at the difference in power draw and peak temperatures.